The Ooni of Ife, Oba Adeyeye Ogunwusi, has said he still holds Oba of Lagos, Oba Rilwan Akiolu, in high esteem despite what happened yesterday. He said he was committed to ensuring unity among traditional rulers in the land. Ogunwusi made the explanation through his Director of Media and Public Affairs of Ooni. 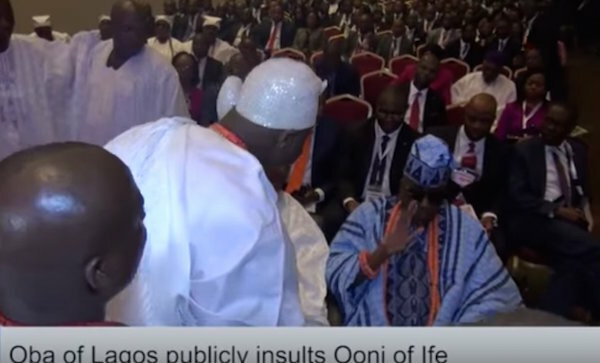 A video which captures Oba Akiolu, snubbing Oba Ogunwusi at a public function has gone viral. The video which lasted for 27 seconds, shows the Ooni of Ife arriving the venue of an event, where he exchanged pleasantries with the Obi of Onitsha, Igwe Alfred Achebe. The Ooni’s attempt to greet Oba Akiolu who was seated next to the Obi of Onitsha was rebuffed by the Lagos monarch who simply waved his hand and ignored the Ooni.